In case you missed it, Android Wear stormed onto the scene recently, bringing three new smartwatches from Samsung, LG, and Motorola. The new watches promise to be the future of wearable computing, and provide Google's vision of what smartwatches should be. All three of the Android Wear watches have vibrant color touchscreens along with features like a microphone, accelerometer, etc. The Pebble uses an e-paper display, which makes it extremely easy to read in direct sunlight. If anything, it's easier to read in sunlight than indoors. The contrast on the display is perfect for reading in almost all light situations. The Pebble screen is always on, with no sleep mode. The backlight comes on when a notification comes in, or when you shake the watch, but the time is always displayed with the backlight off. The display contrast means its very visible, even indoors with the backlight off. When I'm typing, or driving, or working on anything else, I can glance at the watch and still see the time, even without moving my wrist. Both of the current Android Wear watches from Samsung and LG do this, too. The watches keep the display on all the time, always showing the time. When the watch senses wrist movement, it lights up full brightness. The upcoming Moto 360, though, doesn't do this. It keeps the display off when not in use, and only turns it on when it senses the wrist-moving-to-look-at-the-time motion. That means that you can't see the time without deliberately moving your wrist. Both of the current Android Wear watches last around 1 day on battery. That means you'll be charging your watch every single night, like you probably already do with your phone. My Pebble, on the other hand, lasts 4-5 days. That means I can take a weekend trip without taking the charger with me, and that I don't have to keep the charger with me, just in case it goes dead. Currently, Android Wear does not support custom watch faces. Google has said this is coming soon, so in the coming months, this will be a moot point. But for now, if you buy one of the new watches, you're stuck with the watch faces that LG or Samsung include, and no more. 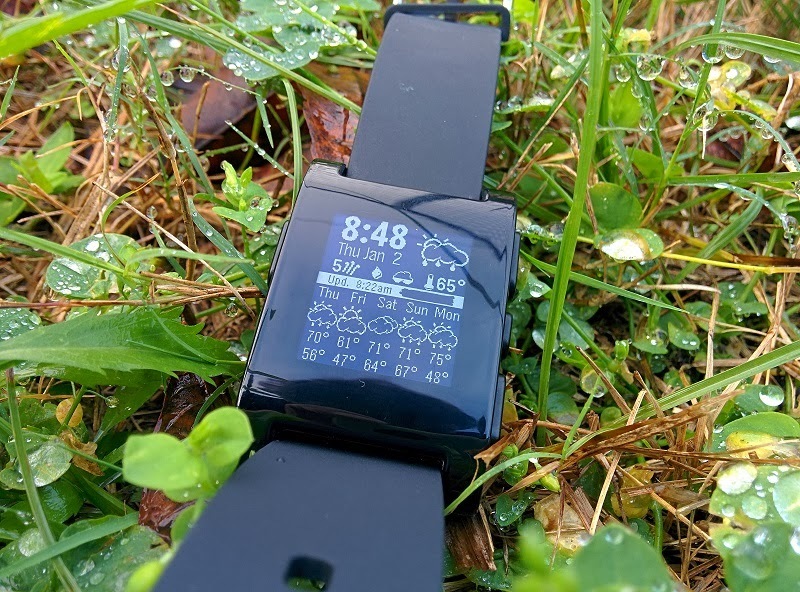 Pebble, in contrast, has thousands of watch faces, many including extra features like weather info. It's a far more customizable experience. I have the original Pebble, not the more expensive Pebble Steel. The Steel, much like the Android Wear watches, has a glass screen, and the Android Wear watches are also touchscreens. I can't tell you the number of times I've smacked my watch into doorknobs, walls, desks, etc. just by walking with it. You go through a door and wham, the watch smacks the door frame. The plastic housing on my Pebble has tons of tiny scratches in it, but it's never broken. If it were made of glass or had a fragile touchscreen, I'd be very worried about it surviving day-to-day activity. The lack of a touchscreen and lack of voice control may seem like a downside when comparing Pebble to Android Wear. And for some people, it could be. But in most of the articles I've read and podcasts I've listened to, the people with Android Wear watches have admitted that they rarely use the voice features and instead use the watch for notifications. Being able to see what's happening on your phone (and sometimes control your phone) without taking it out of your pocket is a great feature that you have to experience to appreciate. But Pebble already does this. The lack of voice and touchscreen distill the experience down to the most important aspect: notifications. By not including extras, it becomes simpler. Don't get me wrong, as a gadget guy, I'd love to have the extra goodies of Android Wear. But not enough to make me want to spend money on a new watch. Pebble may not be as flashy and colorful as Android Wear, but it does notifications extremely well. To be honest, for now, I don't even think I'd recommend Android Wear. Wait until the downsides I mentioned are addressed. If you want a smartwatch right now, today, I'd still recommend Pebble.